The Deer is pictured on a 4 board sign. 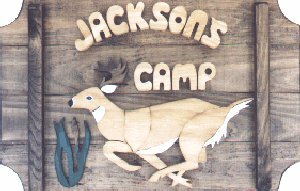 The whitetail deer custom sign is a favorite for the deer hunter. This sign will be a great gift for the hunting lodge or the log cabin. This custom sign will also make a great gift for the wildlife photographer or conservationist alike. This sign with your wording will make a truly unique personalized gift. This sign can only be made on a 4 Board sign.